Phil Kelsall visits the Paramount once again, his concert will include a wide variety of music from across the decades. All performed on the magnificent Compton Paramount Cinema Organ. Songs from the shows, dance music, swing, classical and novelty numbers go together to make for a satisfying afternoon of easy listening. 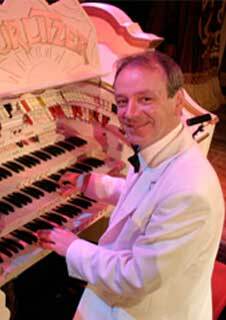 Phil has been principal organist at the Blackpool Tower Ballroom since 1977. He tours the UK and internationally from October to May each year when he starts back at the Tower Ballroom for the summer season. Awarded the MBE in 2010 for services to music, Phil has released over 40 CD's and videos, a selection of which will be on sale at the concert. Come along and hear one of the world's finest theatre organists as he celebrates over 40 years as resident organist at the Tower Ballroom Blackpool.